Q: I haven't seen this Clamp Rack before. Is it new? A: Yes. 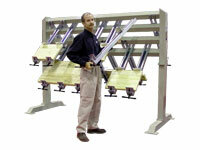 It was officially released at the AWFS (Anaheim, CA) woodworking machinery show on July 30, 2003. Q: Is your Clamp Rack a copy of one that's made in the U.S. (or Canada)? A: No. Even though Kevin Quick spearheaded the original Clamp Rack concept back in 1984, the QUICK Clamp Rack is Kevin's own, brand-new design. The two-sided frame, the 45-degree working angle, and the elegantly simple and effective clamp mounting system are all original QUICK ideas and designs. In addition, as is true with all the other QUICK clamping machines, every single component on our Clamp Rack is heavier and stronger than the corresponding part on our competitor's machines. Again, no, there are no "copied" parts on any of our machines. Q: If your Clamp Rack is so much better than your competitiors' machines, why isn't it more expensive than theirs? A: We have the advantage of having our equipment manufactured by our small, family-owned factory in Taiwan, where materials and labor are cheaper than they are in the U.S. and Canada. This enables us to provide the maximum possible bang for the buck to our customers. Q: Can I buy more clamps for my Clamp Rack? A: Yes. Additional clamps are $87.00 each for 32" opening clamps (or $92.00 each for 40" opening clamps), and can be purchased at any time. Q: Can I get longer clamps for my Clamp Rack? A: Yes. The 32" opening clamps are standard, and are the least expensive clamps because of the relatively high volume of this size clamp that we produce. However, we can provide longer clamps, as well. Contact us for a price quote. Q: Can I use an impact wrench to tighten the clamps? A: Yes. We have a conversion kit for this purpose, which includes wing nuts to replace the clamp handles, and a driver for an impact wrench. Please contact us for further details.